The Bernese Mountain Dog originated in Switzerland and many owners like to select a name that matches to the breeds history. A few unique ideas coming from places in Switzerland include Gallen, Moritz, and Geneva. One of the key attraction of Switzerland are the Swiss Alps which cover a large percent of the country. 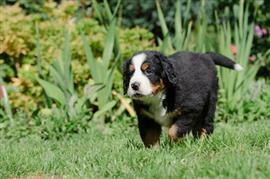 In fact, in Germany the Bernese mountain dog is referred to as Berner Sennenhund. Sennenhund literally means alpine pasture dog. Champex, Leysin, Anzere, Arosa, and Brigels are name choices derived from ski areas within the Swiss Alps. The breed is known to be used as a working dog, often pulling carts. Mush, Ox, and Trolley are some interesting work related choices. The Bernese Mountain Dog is often referred to as a Berner for short. A few fun ideas taken from the homophone burner include Ember, Cinder, Blaze, Friar, and Kindle. Some of our pages will contain a subcategory. A subcategory is a slightly more specific grouping than the main topic of the page. For a subcategory, we will include a separated table of names and corresponding descriptions. An example of a subcategory of Red Dog Names would be 'Dog Names Inspired by Red Wines'. If you have any subcategory ideas for the Bernese Mountain Dog Names page, we would love to hear them. Use the form below to submit your ideas.